OPW’s annual Burrito Booth fundraiser at the Salem Art Fair generated about $3,500 for OPW projects as well as giving some 60-70 volunteers a great chance to work together in a delightful, peaceful atmosphere serving organic vegetarian burritos to hungry fairgoers. OPW’s booth was the only food booth mentioned in the Statesman Journal’s coverage of the fair, following up on their choice of our booth as “best food at the fair” a few years ago — the only time they awarded “best of” selections for the Art Fair. 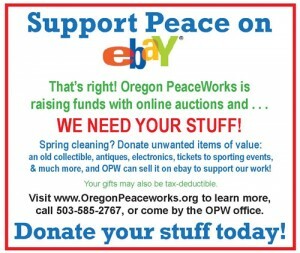 OPW wants thank all our volunteers and all our business sponsors. Without you, we could not have done it. The volunteers are too numerous to name individually, but each of you is greatly appreciated. The business sponsors were: Life Source Natural Foods, Capella’s Market, Emerald Valley Kitchens, First Alternative Co-Op, Food Front (Portland), Gathering Together Farm, Holy Cow, Organically Grown Company, Kettle Chips, Oak Villa Farm, Oceana Natural Foods, Organic Valley, People’s Food Co-Op, Stoker’s VitaWorld, Trillium Natural Foods, Columbia Gorge Organic Fruit and Mother’s Natural Grocery.